After you publish your landing page and get a chimpy high-five from us, there’s a lot you can do to make your page stand out online. To drive traffic to your published landing page, you’ll share it with your audience. Whether your goal is to feature a product or grow your list, there are several ways you can use Mailchimp to promote your page. After you publish your landing page you can use the URL to share your landing on a social media platform. If you’re using a signup page template, you can choose to create an ad or start an automated email to welcome new subscribers. In this article, you’ll learn about how to promote a published landing page. The easiest way to promote your landing page is to copy the URL and share it with people. Share it in email campaigns or social media platforms. You can find your campaign URL in a few different places. Immediately after you publish, you can copy your URL from the high-five confirmation page. You can also copy your page’s URL from the Campaigns page. Here are a couple of ideas for sharing your landing page URL. Use a Button content block to link to your landing page URL in an email campaign. Copy and paste your URL to share it on a social media platform like Facebook or Twitter. To learn more about custom URLs, check out Customize Landing Page URLs. 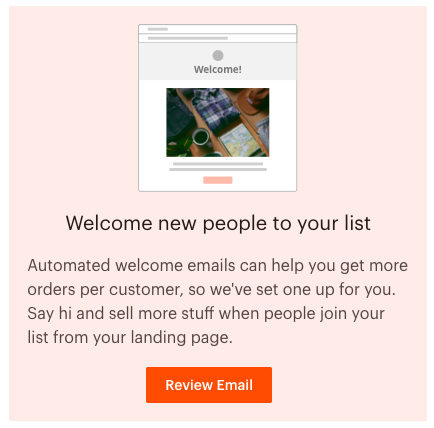 When someone signs up for email marketing from your landing page, use an automated email to welcome them and introduce yourself. If you use a signup page landing page template, we’ll draft an automated welcome email for you right after you publish. Click Review Email to take a look at the automation we set up for you. We’ll pre-fill it with content that you can edit to make the message more personal, or add a special promotion. This automation is designed to welcome new subscribers that sign up from this landing page, so the trigger, audience, and source are all fixed and uneditable. We’ll only send to people who sign up for your email marketing from your landing page. You can pause the automated welcome email at any time. After you publish your signup landing page, click Review Email to view the draft automation. If everything looks good, click Start Sending. If you want to edit the draft, follow these steps. To edit campaign information, click the Edit button in the field you want to edit. Click Edit Delay to change the delivery delay after signup. Click the dropdown menu to set the delay time. The default delay is immediately. Other delay options are 1 hour, 6 hours, or 1 day. Click Edit From to edit the name and email address your contacts will see. Click Edit Subject to edit the subject line and preview text. When you finish editing a section, click Save before moving to the next section. 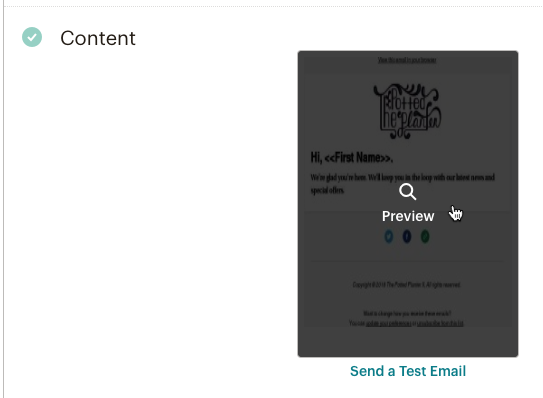 In the Content section, click Preview to see what your email will look like to your contacts. Click X to exit preview mode and return to the checklist. If you want to edit the design or message, click Edit Design. On the Design step, design your email. When you’re done, click Save and Continue to return to the checklist. In the pop-up confirmation box, click Start Now. Nice work! Your welcome email is all set. It will automatically send to people who join your audience from your landing page. Our one-click welcome email is a simplified version of the welcome automation, that you can send right away. If you need more advanced options, like post-send actions or segmentation, click the Use advanced settings link. To learn more about the advanced workflow, check out our Create an Automated Welcome Email article. 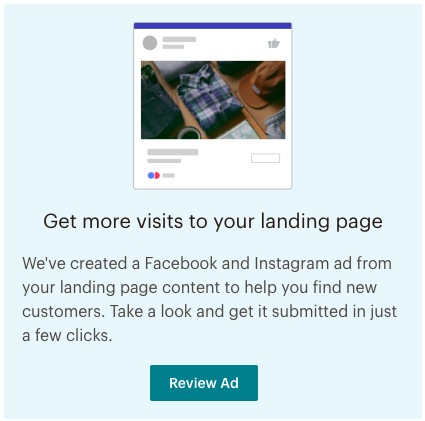 Advertise your landing page on Facebook and Instagram to reach a wider audience. There are a couple ways to do this. After you publish a landing page, run an ad campaign that links your landing page URL in the call to action. After you publish a landing page using the signup page template, we’ll start an ad for you. Click “Review Your Ad” to review a premade ad that links to your landing page. This option is similar to a Facebook or Instagram ad you create from scratch, but it works a little differently. After you publish your landing page, you’ll be able to review and edit the ad’s budget, audience, and content. You can change the picture, but carousel format is not available. The ad is designed to get more visits to your signup landing page, so the URL is not editable. When you choose your audience, keep in mind that we won’t show this ad to any of your existing email contacts. We recommend choosing an audience of new people who are similar to your contacts, or similar to people who have liked your Facebook Page. Your landing page signup ad will be available to run as long as your landing page is published. You can create an ad for any landing page you've published. From the Campaigns page, click Create Campaign, and then click Let us guide you. 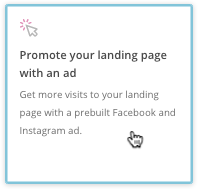 In the Build Your Brand section, click Promote your landing page with an ad. Learn how landing pages work in Mailchimp and how you can use them to streamline your marketing. 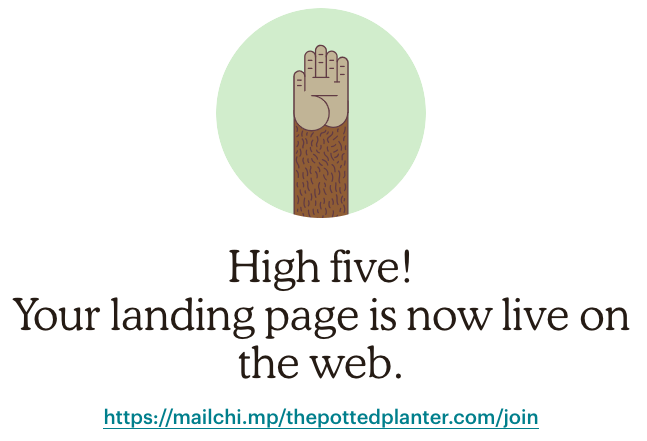 Learn how to create, publish, and edit landing pages in Mailchimp. Sharing links to landing pages is a great way to drive traffic to your page and get more out of your marketing. Learn how landing page URLs work for different account types.